By now there’s not much doubt that protected bike lanes can be a game-changer for cycling in U.S. cities. Making streets feel safe to bike on boosts overall cycling rates, attracting people who otherwise wouldn’t even consider cycling. The safety benefits keep accruing as more people on bikes hit the streets, since drivers become more aware of the presence of cyclists and pay closer attention. Here’s some new evidence demonstrating that bike infrastructure attracts cyclists. A study published in the Journal of Transport and Land Use [PDF] found that intersections in Montreal with protected bike lanes see 61 percent more bike traffic than those without. Meanwhile, intersections with plain old painted bike lanes see a not-insubstantial 36 percent more cyclists. The results demonstrate a strong preference for bike infrastructure — the more separation from traffic, the better. Previous research by Jennifer Dill at Portland State University has also quantified people’s preferences for bike infrastructure over streets without bike lanes. The study, conducted by Jillian Strauss and Luis Miranda-Moreno of McGill University, examined 758 intersections in Montreal. Researchers modeled how different factors are linked to the volume of bike traffic at intersections, controlling for several variables. In addition to the presence and quality of bike infrastructure, they also found a link to land use: the greater the “mix of uses” — or intermingling of retail, housing, and office space — the more bicycling. A 10 percent increase in “land mix,” researchers found, was associated with an 8 percent increase in bicycling. Higher employment density — or the concentration of jobs near intersections — was also found to be a significant predictor of increased bike traffic. Aside from the fact that this logic (they can’t have it unless they’ll comply with the law 100% of the time) fails for all road users, people (whining drivers) don’t realize that if good, safe bike infrastrucutre is built, people will use it, and most people will follow the rules while using it! The newish Dearborn protected bike lane in downtown Chicago is a great example – I go out of my way to use it, and nearly everyone I see on it is obeying the light. It’s actually the drivers that are turning against their red-turn arrow and breaking the law more often (in my experience). If our cities were more like Dutch cities, where the roads accommodate all users, then there’d be much, much higher compliance. The only reason I occasionally run a red light (after stopping and looking) is to get ahead of the car traffic, which would otherwise squeeze me out of the way if we all started going on green at the same time. Look at that picture! 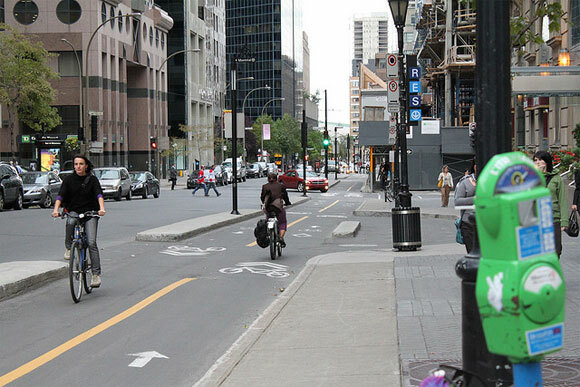 A 2 way protected bike line on a one way street in Montreal. Cost the street one lane of car traffic when they installed it, therefore we will never have it in the US. The only reason why there are traffic lights in the first place is because of cars. Look at the car-free zones of any major city – no traffic lights. So let’s stop blaming the victim! 1) At a traffic signal bikes may use the space in between stopped automobiles and in between a stopped automobile and the curb to pass. Automobiles shall yield to bikes ahead until the bike resumes its position in a marked traffic lane. 2) Red lights at traffic signals and stop signs shall be treated by bikes as equivalent to Yield signs. Bikes may proceed in any direction without stopping after allowing automobile, bike, and pedestrian traffic with the right-of-way to proceed unimpeded. That’s all i can think of right now but, i’m sure there are a few more. If these two alone were to get written into the illinois vehicle code, I think it would go a long way towards allowing a bike to act like a bike and not a car. Maybe they mean all users that drive . . . after all, they can sort through the complexities of a major interchange reconfiguration in 12 months and push it through a regional planning process designed to be resistant to change (new major projects), but need a few years to collect data to evaluate PBLs. Safety for all users? Really. Correlation is not causation. It also makes sense that bike lanes would/should be placed on streets that already had more bike traffic. I vaguely remember reading a study about New York City, where they compared the numbers of cyclists on 1st Ave and 3rd Ave (IIRC) before and after the installation of the 1st Ave bike lane. The results did show some “gravitation” and is more convincing that a simple correlation. Personally, I do “gravitate” toward a protected lane if it’s one or two blocks away from the direct route, but usually no more than that. So I believe there is _some_ “gravitation”, but implying that the bike lanes in the study you quote caused a 61% increase is likely an overestimation. Just spent the day riding around lower Manhattan desperately trying to find bike lanes. The backup to the Holland Tunnel was particularly scary and impenetrable. If they can install one in Washington, DC (15th St NW)…oh wait, they did! Didn’t you read the opening sentence? Remember, every time anybody questions cycletracks, God kills a kitten. There can be no doubt. There’s a similar installation (albeit without concrete curbs) on Dearborn Street in downtown Chicago. Agreed. When the city doesn’t provide any bike infrastructure, cyclists (made up mostly of the “strong and fearless” category) assume the city doesn’t care about them, and therefore have no motivation to follow the law. When protected bike lanes and cycle tracks are installed, it shows everyone (including those who are interested in cycling but are concerned for safety, and are much more likely to follow the law anyway) that the city is looking out for them. If you show people that you do actually have their safety in mind, then they are far more likely to follow the law. Bottom line: if you want more cyclists to follow the law, build more top-quality separated bike facilities. Unfortunately, the paper conflates sharrows and painted bike lanes. I suspect that painted lanes attract many more cyclists than sharrows, which are about as effective as “share the road” signs (i.e., probably not very). The people living in neighborhoods that would be affected by building massive highway flyovers aren’t technically users, so IDOT doesn’t care about them. I’m fine with the stop sign being a yield, but red lights should still be treated as such, except in a few select circumstances. e.g. It’s late at night, there’s no car traffic, and the light hasn’t changed because a bike is not able to trip the sensor. Meanwhile someone has clipped my pedal and told me to “get in your own lane” while riding on similar infrastructure in Chicago. I like sharrows on slow streets, but they give me little safety on busy thoroughfares. It has been on the books in Idaho for 20 years and it would be a great addition to any state traffic code. Cyclists additionally do not need to stop when turning right at a stop light, but must stop before turning left under the the Idaho traffic code. While at McGill University, I wrote an abstract to study whether the amount of additional cyclists attracted by a protected bike lane created enough of a safety in numbers effect in order to overcome the increases in accident rates at intersections. My professor said that until we had more data on the amount of cyclists attracted by protected bike lanes, such a comparison could not be done. Now that this study is completed, maybe we’ll see which is more influential, the safety in numbers effect, or the increased accident rate at intersections with cycletracks. I am hoping that the data collected in Chicago since the installation of the Dearborn Cycletrack will shed even more light on this. I’m a little undecided about making exceptions to certain traffic rules for certain users. I agree that the current system prioritizes motor vehicles and does not appropriately accommodate other traffic users. But, depending how these rule exceptions get handled, it could turn into an “use vs. them” kind of situation. Sure, the law may be the law, but people’s interpretation and, more importantly, their resulting reactions could have a negative ramification for the very minority of traffic users (cyclists) who they perceive as getting unfair, special treatment. This maybe wouldn’t be a huge issue if the majority of traffic users were cyclists and motorist were a minority. As can be seen in countries like the Netherlands, where more people ride bikes than drive cars, cyclists do get some special treatment in the form of contraflow lanes, through-access where motorists don’t, etc. But even there, they don’t get a blanket exception to disregard stoplights or stop signs. The picture that accompanies this article is of de Maisonneuve Blvd in Montreal, where I live. Before the protected bike land went in, there were very few cyclists on this busy thoroughfare. Now, there are many thousands of them all day long. Sometimes a road’s bike-a-bility is killed by high traffic volume, so the before-improvements presence of bikes on a road isn’t necessarily a condition for a successful bike lane. I just used the bike share in Chicago while on a business trip. Got the impression that drivers are bigger assholes there than in SF. I really like the placement of the two-way bike infrastructure on the LEFT side of the road. Paired with implementing a ‘no left turns’ at all intersections, that should minimizes risk of collisions. My only problem with this (and all) protected bike facilities is that they are generally too narrow. People ride at vastly different speeds and I’d rather ride in the road then have to make my trips at <12 MPH. I tried reading the paper and must admit that I don’t fully understand their methodology. As far as I understand it, the finding about bike infrastructure is even less than a correlation, like you would get with before-after comparison. In addition, the fact that there’s more bike traffic on roads with bike infrastructure by itself doesn’t seem particularly desirable. If this only means that existing bike traffic gets channeled away from other route without infrastructure, then what’s the point? So for a proper study, IMO, you’d need to have traffic counts of the route where bike infrastructure will be installed as well as all relevant alternative routes, before and after the infrastructure gets built. That will get you a little closer to making more causative statements. This will be ignored by the “separated facilities only” crowd, but in many places in the US, it’s hard enough even getting some paint on the road, let alone asking for curbs to “protect” cyclists from cars. I also wish people would stop saying “I would side with bicyclists more if they’d just follow the rules of the road!”. But the unfortunate fact is that they do say this — regardless of the fact that the rules of the road were not written with bikes in mind, and regardless of the fact that seeing rule-breaking drivers evidently does not erode these people’s support for car infrastructure. I am glad to hear that your experience in Chicago is that most bicyclists stop at red lights. Mine in New York is the opposite. I ride to and from work every weekday; and I ride for pleasure during summer weekends and on any weekday that’s hot; and I can see a hundred bicyclists blowing red lights before I see one (apart from myself) who stops. Pedestrians who see bicyclists coming up the street typically assume the bicyclist is going to blow the light; and so they tend to hesitate to cross, even when they have the light. I hate that we bicyclists are contributing to this fear amongst pedestrians, thereby making enemies out of our natural allies. I recently had the experience on the Hudson River Greenway of stopping at a “Yield to Pedestrians” sign in order to let a couple cross, and noticing one of them gesture with his head towards me and saying to his partner “that’s rare”. So uncommon is a bicycle stopping at a red light, that I occasionally get thanked when I stop — thanked for simply following the law, which is a sad state of affairs. One woman once actually said to me “you give bicyclists a good name”. That made me feel good, as I follow the law with precisely that goal in mind. But the problem, of course, is that there are thousands out there giving bicyclists a bad name, thereby effectively campaigning for the end of our bike infrastructure. Ideally, bikes should be able to treat red lights as stop signs, and stop signs as yield signs. But in order to get to that state where we’ll be afforded this special (and entirely logical) treatment under the law, we first have to quit behaving as though the laws as they exists today (even the stupid laws) don’t apply to us. While I wish that every avenue had a bike lane, I wouldn’t call the avenues without lanes “terrifying”. In particluar, Madison Ave. is great to ride on. And Third Ave. is pretty good, also. Why comparing Canada/Europe with the U.S.? Apples and oranges. What works in other countries are not even remotely welcomed in the U.S. let alone working here. The mindsets are vastly different on so many levels. The point is not what particular kind of infrastructure is used; it’s that any kind attracts more people on bikes, and the more separation from cars, the safer people feel and are more inclined to use their bikes. I imagine the psychology is the same in any city around the world. This is really not a problem inherent to protected facilities, but it is quite different. I think that this assumption about the danger of intersections suggests that a fresh approach is need at intersections, because intersections in the Netherlands are not so dangerous as they are in the US. Dutch experience shows that if you build it, they will come. I think qrt145 was agreeing with the article and disagreeing with the weird comment. Perhaps this indicates that there are too many traffic lights in NYC, or that they are very poorly timed. I always look before executing a yield to stop (I don’t usually go on roads w/ red lights). I personally think that there are too many stop signs in the USA.